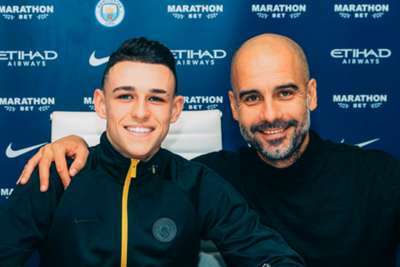 Manchester City have tied one of their star youngsters to a new deal, with Phil Foden putting pen to paper on a new contract running to 2024. Foden is yet to start a Premier League game but is considered one of the brightest talents in England, although the 18-year-old has rejected comparisons to Barcelona icon Andres Iniesta. City have lost out on some of their prized talent of late with Jadon Sancho moving to Borussia Dortmund, who he has helped to top the Bundesliga table, earning England caps in the process. Brahim Diaz is also expected to follow Sancho away from the Etihad Stadium with Real Madrid reportedly lining up a deal for the teenager, whose contract is set to expire next year. Stockport-born Foden committing his future to City is therefore a major boost for City, who suffered their first defeat of the season at Chelsea in the Premier League at the weekend. "We are delighted to have secured Phil for the next five-and-a-half years," said director of football Txiki Begiristain. "He is an outstanding talent and he is Manchester City born and bred so this is where he wants to play his football. "Under Pep and with the players we have here around him, he is in the best place possible to develop as a player." Foden scored his first City goal in an influential performance in September's EFL Cup win at Oxford United, while he has made eight Premier League appearances as a substitute this term. "I'm over the moon," Foden, an Under-17 World Cup winner with England, told City's website. "I've been here since day one – I've grown up and seen a lot of new faces and people. "It's a dream come true to sign a new contract. My aim [now] is to be patient and take the [first-team] chances as they come."